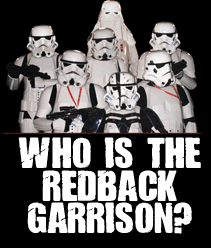 Redback Garrison » Blog Archive » Toowoomba Carnival of Flowers Parade. Toowoomba Carnival of Flowers Parade. September 19, 2009Posted by Moxxxie Comments Off on Toowoomba Carnival of Flowers Parade. Mission: Maintain Order, General Intimidation and instill fear and trepedation into the feeble earthlings! While this was always going to be a tough ask in between Gencon, we managed to get 15 people to walk. Trinity had a brain wave the day before, getting everyone to meet at a Church that I used to go to, right near the start line. We contacted everyone we could by phone and Gencon, copied maps and met there. The response just GOING to the start line was amazing alone. Trinity had recon’d our spot and we all met with her. The parade went without a hitch, but we got left behind by the floats in front. We’re sure they weren’t going 8-10KM/hr, so we tried to keep up, but the back guys were having to much fun and we ended up covering over 100m of the parade. Not sure whether we’ll get in trouble for that yet. Oh well. We were a HUGE hit. From regular people, we were on of the TWO highlights. While we didn’t get ANY media coverage, bar ABC radio, thats another story all together, we didn’t win any prizes. ABC guy did a 5 minute radio interview with me and wants to do a video, doco on the 501st in Australia by the end of the year. He also wants to join the 501st and gave me his card with the instructions “CALL ME!” So we’ll see how that pans out! Watch this space. The paper was suggesting 100,000 people were in attendance to watch the parade. I was thinking more like 50-60 thousand! So conservatively it was probably somewhere between the two. See……I told you it was big! NO malfunctions except for Wolfs thigh breaking before the walk. I was blimmin sore for the next 2 days though. A big thanks to all the guys that came up. I know it wasn’t easy and I hope you feel it was worth it. Neo, trinity, Minnie Gree, Ex Ed, Wolf, Crypto, Kuki and Clan, reaper and clan, Cam (in my TX), Rents. Injuries: Nothing a Bex and a good lie down couldn’t fix! A Successful Mission, with more photo’s taken of us than the parade winner! Go figure! Pictures: More coming, but thanks wolf for posting yours up! This entry was posted on Saturday, September 19th, 2009 at 12:18 pm	and is filed under Mission Reports. You can follow any responses to this entry through the RSS 2.0 feed. Both comments and pings are currently closed.